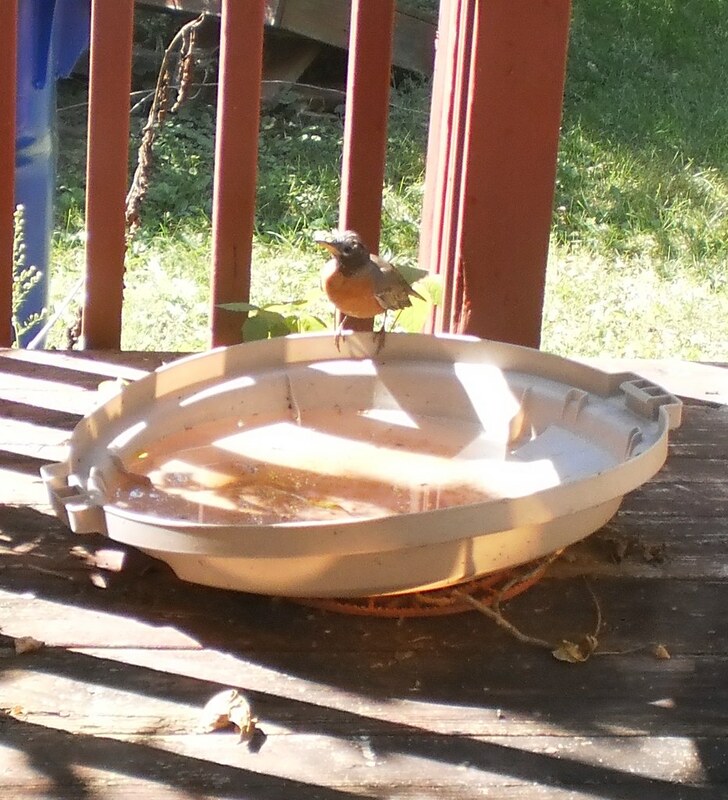 It has taken a whole summer, but, finally, yesterday, while I was sitting here reading the game cast off ESPN, I got proof of the use of my birdbath. He knows I'm on the other side of the glass. He knows I've been trying, all summer, to get a photo of someone, usually a robin, using the bird bath. He's got particularly good timing for flying away, except yesterday. Maybe he finally realized all I want is proof the thing's being used. Then, last night in the gloaming, I heard noises outside. Three chickadees were frolicking in the bath. It was too dark to get any kind of photo. I've had a male and female cardinal in the bath, too, but they are more skittish than the robin. It's going to take quite a bit of patience on my part to get them to understand neither the cats nor I mean harm. A source of drinking water in winter is good for birds. I'm going to try to keep this open through the winter, on weekends, when I can use tepid water, which will be warm, compared to the outside air. With any luck, I'll have more birds get to know my house.